In journalism circles, 2016 is the year of the fact-checker. "It's really remarkable to see how big news operations have come around to challenging false and deceitful claims directly. It's about time," said Brooks Jackson, the director emeritus of FactCheck.org. PolitiFact editor Angie Drobnic Holan added: "All of the media has embraced fact-checking because there was a story that really needed it." If fact-checking was just a sidebar before, it is now front and center. One man is responsible for that change: Donald Trump. Trump made fact-checking great again. "I would say fact-checking was always great," Washington Post reporter Glenn Kessler said. "Even before Trump's emergence, political fact checking had exploded around the globe. Trump, however, certainly helped generate a lot of traffic to fact-checking websites." Kessler said monthly unique visitors to the Post's Fact Checker blog this year were "five times higher than in 2012." Other fact-checking destinations have reported big upticks in traffic too. Holan said PolitiFact's file about Trump has had 2.7 million page views so far this year. "Fact-checking is now a proven ratings getter," Jackson said. "I think editors and news directors see that now. So that's a plus." Occasionally CNN even fact-checked Trump right on screen. One graphical banner in August said "TRUMP CALLS OBAMA FOUNDER OF ISIS (HE'S NOT)." The fact-checkers interviewed for this article work for competing news organizations but have come to similar conclusions about the presidential race: While Hillary Clinton sometimes shades the truth, Trump is uniquely fact-challenged. "The level of inaccuracy is startling," Holan said. Once the GOP primary debates began last summer, it was evident that "Trump was off the chart," she said. At the end of 2015, PolitiFact said Trump's statements collectively received its "Lie of the Year" award. His claims are regularly rated "pants on fire." Kessler works on a "Pinocchio" scale -- the more brazen the misstatement, the bigger the nose. He said "Trump earned significantly more four-Pinocchio ratings than Clinton" -- 59 versus 7, to be exact. "The numbers don't lie, and we frequently reminded readers of the differences." Daniel Dale of the Toronto Star put it this way: Trump "is not a normal political liar." In the fall, Dale started something called #TrumpCheck, a daily accounting of every word Trump uttered. He thought the actual count, the raw number of fibs and falsehoods per day, helped tell the story of Trump's candidacy. Dale sets a very high bar, holding the candidates to the exact truth. He counts exaggerations as false claims. During the first presidential debate, he found that Trump said 33 false things while Clinton said four. The same pattern was evident at the other two debates. Trump is unique, Dale said, because "he gets things wrong on subjects where there's no political advantage to be gained. And, in those cases, it's not clear whether he's lying or simply confused or unwilling to take the time to learn the facts." Of course, Trump supporters assert that Trump is getting at a deeper truth through his speeches, even if he makes mistakes with basic facts. Some supporters reject fact-checking altogether, claiming it is completely biased. Holan's response: "We're completely transparent in how we rate these fact-checks; the sources we use; and people still see us as independent." Besides, she pointed out, this is not a "particularly partisan issue. Trump's record looks totally out of whack when you look at his record compared with the other Republicans who ran for president this year." Holan acknowledged that "people don't vote for candidates based solely on their accurate recall of the facts." But she has been heartened to see the surge in attention this year. PolitiFact is supported by the Tampa Bay Times, its news organization partners and some financial contributions from foundations. It recently launched its first broad-based appeal for donations from readers, "with an eye toward launching a membership campaign in 2017," Holan said. FactCheck.org has been benefiting from reader donations for years. This year CNN's Jake Tapper partnered with FactCheck.org for a weekly online video series looking at claims by the candidates. 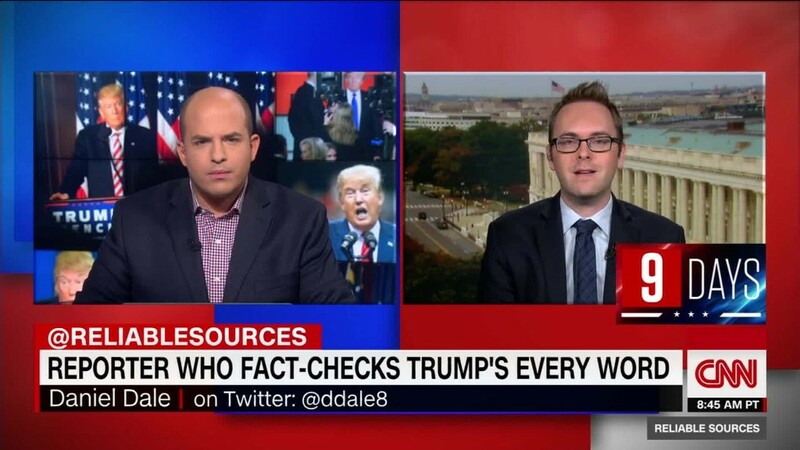 CNN also had a Reality Check team pore over claims made during debates and other events. In newsrooms like PolitiFact's, editors are hopeful that this interest is permanent -- regardless who wins on Tuesday. Jackson, a former CNN correspondent who recalled fact-checking campaign ads back in 1992, cautioned that "news executives can be pretty fickle." Holan's view is that "leaders of news organizations need to be committed to fact-checking, because it often evokes strong reaction from partisans." In other words: hate mail and blowback. But viewers and readers have also shown that they value the accountability function of fact-checking. "I don't think it's a given that it's here to stay," she said, "but I hope that it is."